Wohooooo time is flying so fast these past couple of weeks. I am glad because in 31 days, we would be flying back to our home sweet home in "Country road, take me home to the place where I belong, West Virginia...." Nyahahaha kinanta na eh. But anyhow, the them for this week's Mommy Moments is the precious gift that we received from our kids. I think most Mom would agree with me when I say that the most precious gifts that we have received from our children is when they give us hugs and kisses. And most especially when they say the sweetest five magic words "I love you Mom & Dad". Here are some sweet hugs and kisses from my chubskulit burritoes. When I was still nursing EJ, he would kiss me first and say "I want mimi". A loving hug from my sweet princess. 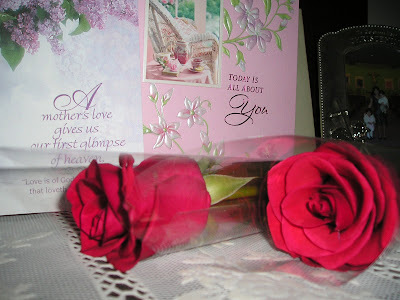 A sweet hug and kiss in the morning energizes your whole day..
A set of roses that they gave me on Mother's day this year. 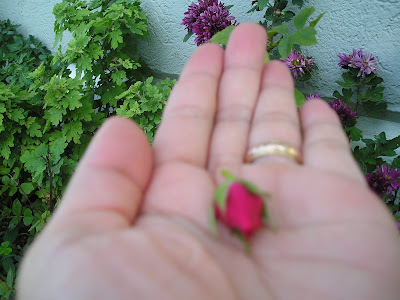 EJ gave me this rose bud that he picked in our garden. 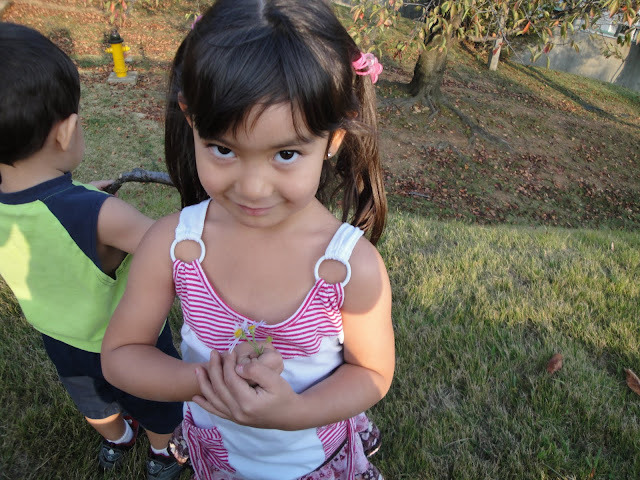 Whenever they go for a walk without me, EJ would always picked up a piece of rock or leaf and gave it to me. I always saved them in a flower basket. I should have wrote the dates but I neglected to do it. 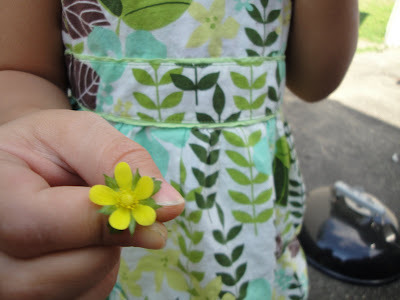 My daughter love picking flowers for me. Even a flower from the weeds. Here are some dandelion flowers. 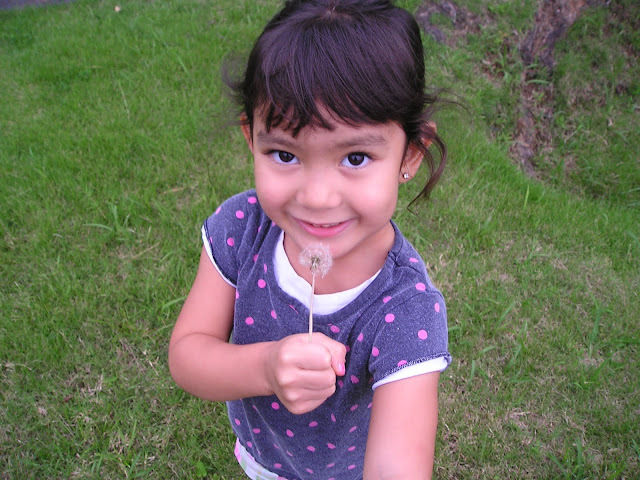 Old dandelion flower, she calls it whispery blossom because before she blows it, she whisper a wish first. 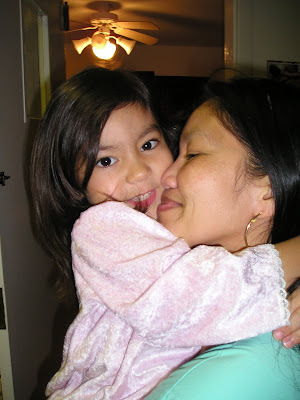 Sometimes she would say "I love you Mama!" Here are some wild daisies that she gave me. And another weed flower hehehe. 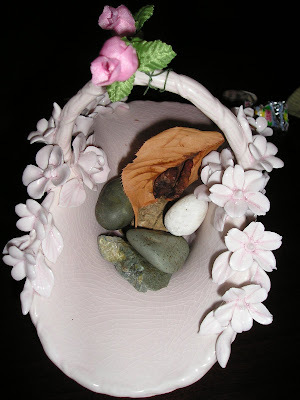 And she made this flower for me out of clay dough. Thanks a lot kiddoes, Mommy loves you so much! Gonna miss u na naman!! awww.. it touches me a lot sis, how young children could make such sweet gestures to show their love to you.. They are indeed your best gifts and not to mention their beauty that you as a mother could be proud of.. Ganda talaga sis..
aynga pala sis gusto kong palitan yong link mo sa sidebar ko ha... with this (nostalgic marveling) mas makikita ko kasi dito ang documentation ng family mo. so sweet kids. i agree that sweet hug and kisses energize us the whole day. our kids are our inspiration..
you are so blessed Rose. i love all the pictures very sweet moments talaga. Thanks for sharing your sweet photos and have a lovely weekend. Those are all nice photos and your kids are really sweet. You are such one lucky mom. woi sis, congrats ulit dito...PR2 na blog mo...wohooo.....am happy for you....you deserve it! smile pa lang so precious na. Don't we all just love hugsies and kisses from our kiddoz? its priceless talaga. Happy MM momi :) and hope Jillian gets the smile of the month, she's so cuuuuute. ang sweet naman nila. their smiles are really priceless! wow, ang sweet naman ng mga kids mo.. Those were priceless.. the moments, and the thoughts in it..
ilang days na lang sa paguwi nyo.. i knew the feeling, im excited din para senyo!! awwwwwwwwwwwwww so sweet are ure kids, really its true when they hug us or kiss us, it would really make our day ang sarap ng may anak noh? I agree....hugs and kisses from our 'angels' are truly precious gifts, and its completely unparallel to any material gifts. I love this post..your angels are so sweet...you're a lucky mommy. Oh! I miss my angels while looking at the photos. Nalipat na pala ibang meme dito bakla hehehe. 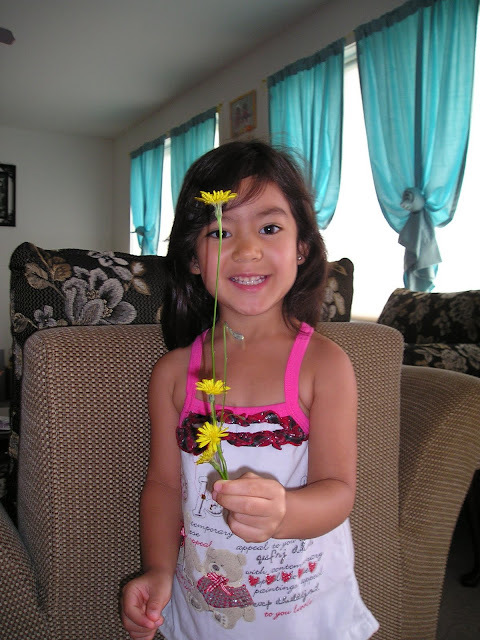 Ang sweet ng mga anakins mo bakla.Napakasweet ni Rylie she always gave you flowers awwwww. Love you MM photos bakla as always. bunches of lovely pics to enjoy my eyes. thanks for sharing. I went to vote again, kaya pala hindi ko nakita si Rye at first nawala pala ang pics hehe. thanks for the visit bakla, sencya na hindi ako nakadalaw lahat ng blog niyo yesterday, hindi na makaya ng bakla kung kapangyarihan hehe sobrang busy, nakakapagod mag bloghop na isang kamay lng. i love love your photos! esp the one when EJ was kissin u! so sweeet! u have sweet kids! lucky u! thanks for checkin out mine sis! Rylie is so sweet and adorable. kanina pa sana ako mag comment dito, eh nagmamadali naman ako at ako eh kumuha ng tag para sa akin kotse..
Ang gaganda ng mga anak mo Mommy Rose, ang super sweet, kahit si EJ, ang sarap halikan, hehehe! Isang halik nga dyan..TSUP! Ay naku, kahit wala na siguro ikaw mareceive na regalo, basta ang mga anak mo eh nandyan sa tabi mo, super saya ka na.. Have a great weekend..
agree of what you've said Rose! sarap naman ng mga hugs and kisses na yon. You just made my day by all the pictures you posted here. I can not describe yung happiness na makita ang magagandang litrato nyo nang mga anak mo. How sweet and thoughtful naman nang mga angels mo. They expressed their love for you in their own small ways at talagang nakakataba ng puso. Talagang precious gifts nga sa iyo ang lahat ng thoughtfulness ng mga anak mo. Siguro palaging nasa cloud nine ka dahil sa kanila. Sabi nga, wala ka nang hahanapin pa. Congratulations na malapit na kayong umuwi sa sariling bahay nyo sa Virginia. Makakakita rin kami nang mga pictures nyo dun kapag nakauwi na kayo. Thanks for the post, the photos and the wonderful memories. I love them all. God bless you always. Oh I tottaly agree w/ you Rose Hugs & kisses & those noble words are really such a precious gift we can ever receive from our precious child. Your kids are so sweet & you're really Blessed. My youngest used to give me rocks too whenever she found it along the way.Nilagyan ko ng date & kung ssang place nya napulot. Btw,happy to know you'll be home na.Happy packing & happy trip.Sayang nga lang malayo ako sa Narita e di sana sinugod na kita agad sa Narita hehe.Hugs & kisses to Ej & Rylie!Mwah! such a sweet gifts, their smiles is the best gift ever lalo na pag your are having a bad day, di ba, Rose? 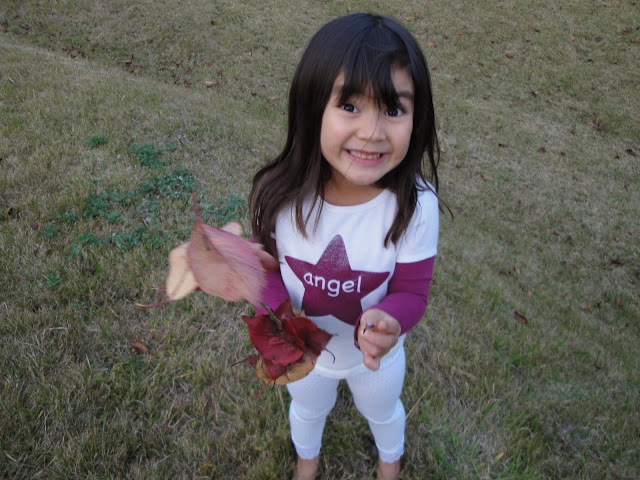 our kids are precious gifts from uo above! Im back here Bakla greeting you guys a Happy Halloween. Awww, it's so sweet that you have such a loving children. God bless! Rose, thanks for your comment on my blog. Appreciate it. I'm curious, what does EJ mean when he wants "mimi"? wow, i love flowers. it's all the more sweet because it was given by your ittle one.